Conservative columnist and commentator George Will has slammed Sarah Palin saying she should not be trusted with nuclear weapons. Will was speaking on ABC yesterday and his damning words,coming from the right, may give many people pause. "Two things are infinite. One is the expanding universe, and the other is media attention to Sarah Palin, who is a genius at manipulating it. But she has several political problems. The first of which is there's no undecided vote in this country anymore about Sarah Palin. Sure, second, the threshold question, not usually asked, but it’s in everyone’s mind in a presidential election. ‘Should we give this person nuclear weapons?’ And the answer [in Palin's case], answers itself"
Will and other GOP heavyweights are suddenly running very scared that Palin is a legitimate contender. She represents their worst nightmare, a grassroots candidate who owes the old bulls in the GOP nothing and who is prepared to say so. 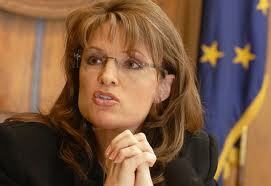 Sarah Palin is actually looking better and better because of Will and others attacking her. She is showing that she has the real handle on how to shake things up in America, even within her own party. That is why Will and company are so scared.